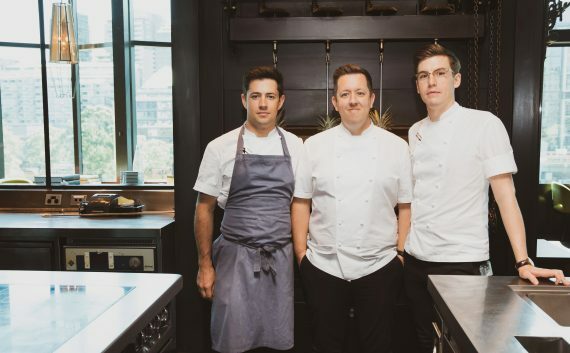 Head chef Evan Moore and head pastry chef Gareth Whitton tell us about their paths to Dinner & what it is like being mentored by Ashley Palmer-Watts. I’ve never really had a job outside of a kitchen. I started (in hospitality) at 14 as a kitchen porter in my hometown of Oakville, Ontario. Then I went to culinary school in Toronto, whilst working in one of the city’s high end restaurants. At 19 I moved to the UK and did a two month stage at The Fat Duck. It had recently been named the best restaurant in the world; Heston was captivating on his Perfection series and I could get an ancestry visa with working rights through my grandfather so it all seemed to fall into place. Afterwards I tried to get a job there but I didn’t have the same experience as others applying for the job so that fell through. Soon after I started working at the Capital in London with Eric Chavot. When he left to follow other pursuits, so did I and went on to work at Robuchon, London. After the better part of a year there, I heard from the roommate I had when I was at the Duck that Dinner by Heston Blumenthal would be opening. I sent an application in and was hired as a demi chef de partie. I was there for five years, rose to sous chef and was offered the position of head chef at Dinner, Melbourne so relocated here in 2015. I never really saw Ash too much when I was at The Fat Duck (at that point he had left the day to day operation to work on the opening of Dinner). I think the first times I met him were at a role call interview for Dinner London then at a presentation he gave about the dishes and how the restaurant would run. I think he has trust in me to make decisions that he would make if he were here. It’s a very amicable relationship; we generally have a lot of shared interests and views. Whenever he is here conversation is always very fluid whether it be social chat or serious restaurant business. We are both pretty observant people, notice the same things and share similar opinions most of the time. He is generally very busy and not one to babysit when it comes to smaller matters, but always gives guidance with big things. Something I have learnt from him is while it is certainly good to enjoy recognition, it is important not to get distracted, and to stay focused on creating, developing dishes and furthering the restaurant. I went to college for a year and a half but found myself not to be a man of institutions so decided to leave and train on the job. I was also a kitchen porter at the age of 14. My first job in the kitchen was at Centennial Vineyards in Bowral. Someone I worked with there later helped me to get my first big break at Pier. 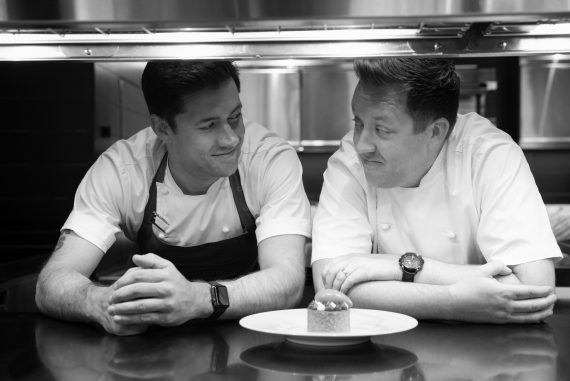 Years after that, a friend and mentor at Quay, who happened to be ex-Fat Duck, sowed the seed of wanting to work for Heston and the Fat Duck group. Long story short, I eventually did a trial at Dinner London, spent a year there as a CDP, then moved back to Sydney for a while. The intention was always to move to Melbourne so as soon as I got the call to be pastry sous chef as part of the Dinner Melbourne opening team I jumped at the chance. I’ve always had stuff to talk about, mostly sports, and a good dynamic with Ash as we have similar interests. As we got further into the labyrinth and I gained more responsibility, our relationship gradually got more professional. Ash is someone I definitely admire- his resolve and calmness under pressure; and his pure enjoyment of delicious things, be it in the shape of a beautiful piece of fruit or an exceptional cut of meat. I often think to myself, ‘What would Ash do?’ but one very important thing he has imparted to us all in all of the Fat Duck Group restaurants is, “They who shout, have lost control”. I always remember this and try to pass it on. Want articles like this sent to you?